In its latest market report, analytics firm Gartner revealed that the sales of smartphones like the iPhone 5 and the Samsung Galaxy S4 are outpacing sales of older style feature phones for the first time ever. 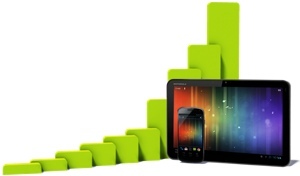 In the second quarter of 2013, approximately 225 million smartphones were sold worldwide – an increase of 46.5% over sales figures for Q2 2012. Sales of dumbphones, meanwhile, slumped 21% to 210 million. Much of the smartphone growth comes from overseas – the Asia Pacific region, to be specific. Another piece of interesting news in the Gartner report: Four out of every five smartphones in the world now run a version of the Android operating system. This is likely because Apple phones are indicators of wealth – less-affluent people worldwide simply can’t afford to pay $650 for an iPhone when Android phones sell at a fraction of the price. Are you a feature phone owner considering making the switch yourself? Check out Techlicious's pick for the best Android smartphone of 2013. And be sure to take a look at our breakdown of U.S. carriers' smartphone plans to find out exactly what owning your new device will cost over the long run.